College football’s championship team, the Clemson Tigers, had dinner at the White House on Monday night, and we’re still recovering from it—mainly because the photos are so shocking. 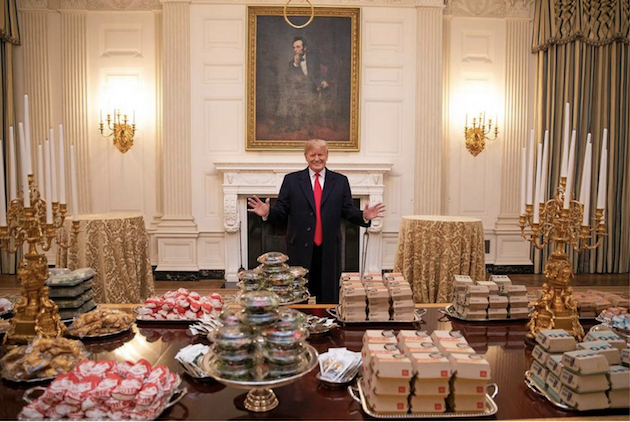 The grinning president of the United States presiding over a meal fit for … well … hungry college football players? "Or do I … send out for about 1,000 hamburgers?" asked the president. "Big Macs. So we actually did. We bought 1,000—Burger King, all American companies. Burger King, Wendy’s, and McDonald’s. We have Big Macs. We have quarter-pounders with cheese. We have everything that I like, that you like." The cost to the president is estimated at $3,000. The media were in a state. Gone was the elegance of the Obama years—the state dinner for Indian prime minister that included compressed avocados, crisped halibut in a ginger-carrot sauce, and mango crème brûlée with ginger tuille—and in its place, boxes of burgers, Domino’s Pizza, Chicken McNuggets, and dipping sauce packets in silver bowls. The president knew exactly what he was doing. "Trump has … set a perfect trap for his critics, whose sneering at the feast will come off as elitist, whose taunts will come off as slights to the harried mom or dad who picked up a Big Mac and two Happy Meals on the way home from work," writes Sonny Bunch. "Here is an easy chance to play up the ‘us against them’ angle that has formed the heart of his appeal, the whole reason for his presidency. If you point out that it’s inappropriate for an official White House dinner, even one for college kids, to consist of fast food, you’re a snob, you don’t get it, you’re out of touch, you hate the working man." In addition, as some have pointed out, it’s been done before. "King Tries Hot Dog And Asks For More" ran the New York Times headline on June 12, 1939. That would be the King of England, George VI, who, with his wife Queen Elizabeth and a royal entourage, spent a Sunday with the Roosevelts at their Hyde Park estate. "It was with some obvious misgivings that Mr. McDermott [the State Department’s liaison officer] first conceded, in answer to questions, that the King had eaten hot dogs at the picnic," the Times reports. "He said that it was safe to assume that the King had done so since he had announced that he had been looking forward to the chance of sampling the favorite American snack." My sense is the king would have also enjoyed that Quarter Pounder with Cheese, now made with fresh beef. My chief concern is the length of time those sandwiches were sitting on the table before being consumed. Mind you I am not talking about shelf life—remember the story about the guy who discovered a 14-year-old McDonald’s burger that looked brand new? Rather, I am referring to the length of time a burger is allowed to sit in the bin. "Hamburger patties that exceed 15 minutes are not sold," according to McDonald’s Canada. "About 15 minutes," agreed former McDonald’s employee Sonny Bunch. 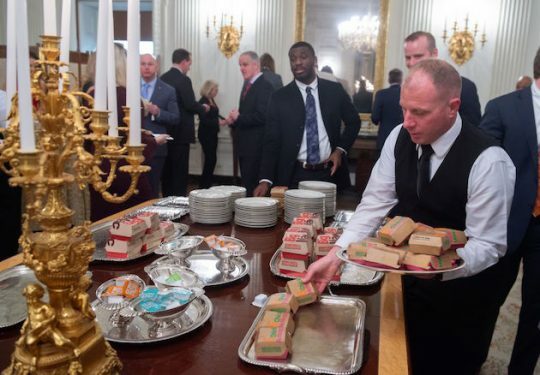 As Jim Rome mentioned on his radio show, "Eating fast food at the White House is totally fine and in fact, better than fine. Eating fast food off White House china is cool. Eating cold fast food off anything is horrible." Let’s hope the president kept his speech short. Updated 12:30 to include Jim Rome's sentiments. This entry was posted in Culture and tagged Donald Trump, McDonald's. Bookmark the permalink.